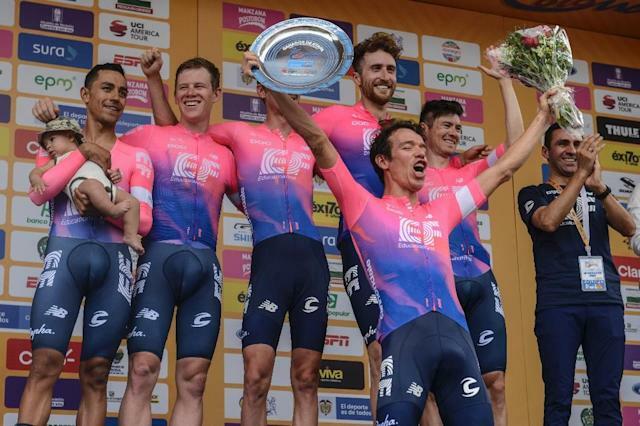 Medellín (Colombia) (AFP) - Local favourite Rigoberto Uran took the first leader's jersey at the Tour Colombia after his Education First Drapac team won Tuesday's opening team time-trial, with Chris Froome's Team Sky settling for third. Education First covered the 14km race against the clock in 15min 05sec, eight seconds clear of Belgian outfit Deceuninck-Quick Step with four-time Tour de France winner Froome's British team a further two seconds back. Uran, the Tour runner-up to Froome in 2017, is a hugely popular figure in his homeland and finished third last year in the inaugural edition of this race, behind compatriots Egan Bernal, of Sky, and Movistar's Nairo Quintana. "We're really happy to have won today and the most important thing for me is to race here at home and to be able to win with my people, with my public," said Uran. But it wasn't such a happy day for Quintana, a twice runner-up to Froome at the Tour de France and past winner of both the Giro d'Italia and Vuelta a Espana. Movistar finished 44 seconds off the pace in Medellin, leaving the local fans' darling with an uphill battle to impose himself on his home tour. The next four stages are comprised of largely flat street circuits ahead of Sunday's grand finale, a 174km ride from El Retiro to the steep summit finish at Alto de Palmas. Four of the six stages will take place entirely above 2,000-meters while the highest point in the race will reach 2,600m. Froome has spent two weeks training in Colombia ahead of the race and said it was "a fantastic place to train in terms of the altitude." Altitude will be an important feature of July's Tour de France with seven climbs rising above 2,000m including the Col de l'Iseran, the highest paved mountain in Europe at 2,770m. Froome said before the race, though, that his aim was merely to "survive" with team-mate Bernal perhaps a better bet to retain his title.